Before you can begin to use this headset, you will have to charge it (aprox. 4 hours) via the included USB cable. Once the LED on the USB connection on the headset turns green, you’re ready to rock. The setup for the Vengeance 2000 headset is extremely straight forward. Attaching the USB transmitter either directly to a USB connector in the back of your system or via the included USB extension cable, my Windows 7 system automatically installed the drivers. 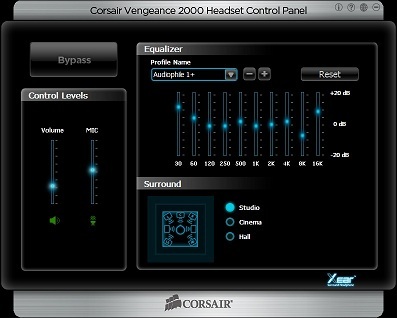 At this point the headset is functional, and you “could” stop there, but if you want to enjoy the 7.1 surround support with this headset, you will need to visit the Corsair site to download the latest drivers (at the time of this writing was version 1.7). With the Corsair drivers installed, not only do you get the 7.1 surround support (via the integrated CMedia Xear), but you also get a control panel that offers additional settings. With the headset connected and the Corsair drivers installed, let’s take a look at the control panel. Inside the control panel are various settings that can be configured that can, in some cases, dramatically change the sound production depending on what you are listening too. Starting off, there is a fully functional equalizer that allows for granular manipulation of the individual sound frequencies. If this is too intimidating, Corsair has several preset “Profiles” that can be selected which target key usage areas (audio, gaming, and movies). Below the equalizer section is the Surround section. There are three settings here that essentially manipulate the strength of the emulated 7.1 surround effect. On the left are slide controls for sound and mic volume. Finally, in the top left is a “Bypass” button that allows you to turn off the Xear support and run the Vengeance 2000 headset in stereo only mode.